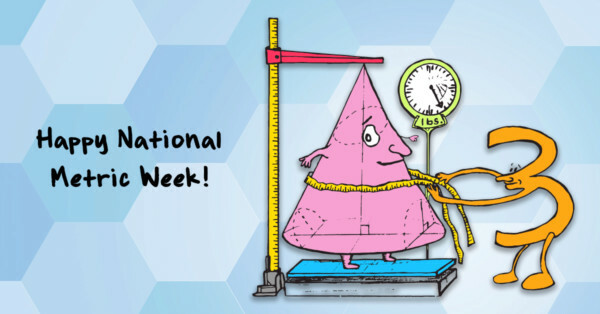 Did you know that every year, the week of October 10 is National Metric Week? There are many great reasons to recognize and celebrate the metric system, the first being its ease of use. Because of this, it’s essentially accepted as the standard measurement system worldwide (with very few countries holding out on full implementation), allowing for consistency in measurement on an unprecedented scale. Subsequently, the metric system has been instrumental in facilitating global trade and other collaborations across nations! The world as we know it would be very different today were it not for the metric system. The week of October 10 (10/10) is a fitting window of time for National Metric Week, considering that every time you count 10 of a given base metric unit, you’ll get 1 of the next unit. Convert 276 km2 to m2. Convert 785 cm3 to km3. As the metric system is a decimal (base 10, “deci” meaning “10”) system, in many cases, you don’t need to calculate to convert … simply move the decimal point left or right! This is why it’s extremely easy to convert between metric units—much easier than with other measurement systems out there! The metric system is also known as Le Systemè International d’Unités—SI for short! The original “meter” was defined as one-tenmillionth of the distance from the equator to the North Pole, measured along the prime meridian. Today, it is defined as 1/299,792,458 of the distance light travels in a vacuum in a second. The metric system was officially introduced in France in the 1790s. Over the centuries, most countries worldwide adopted it as the standard measurement system. While most countries use metric units exclusively, others have yet to adopt it fully. With many elements of daily life measured in miles, inches, feet, pounds, ounces, quarts, gallons, etc., the U.S. remains the only industrialized nation that has yet to go fully metric. However, it is the established measurement system for certain industries, particularly within STEM fields. Other metric holdouts include Myanmar and Liberia. Metrication is the process by which countries go metric! Did you celebrate National Metric Week? If so, how?